Try some fun new party themes. 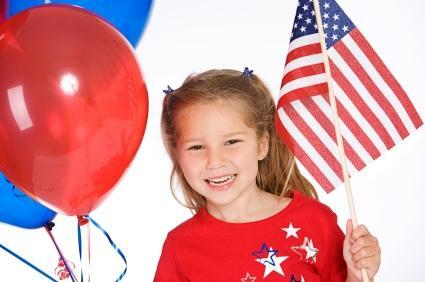 Patriotic party themes can be used for almost any type of party, but are especially appropriate for the Fourth of July. Combine traditional themes with new ideas to create a patriotic and fun atmosphere for your guests. For those who work or volunteer with the military or even the government, a patriotic theme would suit just about any occasion. The real appeal of a patriotic party theme is that it can be incredibly simple to pull everything together, using patriotic colors and decorating with flags and symbols. Here are some suggestions for overall themes. Using a red, white, and blue theme is the easiest way to set a patriotic tone for your party. Common supplies like tablecloths, napkins, and dinnerware are easily found in these colors at party supply stores, and you can decorate with American flags in a variety of sizes. If children are attending the party, ask each one to draw a picture using only red, white, and blue crayons or paints, and display the works of art on a special wall or fence "gallery"
If you're having trouble finding supplies for your patriotic party at local party supply stores, here are a few places online that have a wide selection of themed supplies, favors, and decorations. Party 411 - Enjoy a wide variety of patriotic party supplies, including cardboard cutouts of political celebrities. Party Supplies Hut - The stars and stripes can be found on dozens of items here. Party Supplies World - In addition to the usual party fare, you can also find shiny centerpieces and outdoor lanterns in red, white, and blue. Consider using a patriotic theme for your next party, and see what kinds of fun ideas you can come up with to celebrate with your guests!